Melaye, made this known during a press briefing. It is my sincere pleasure to address you this morning. It wouldn’t have been necessary to address you on the subject matter am about to address you on but it has become expedient that despite the fact what I am addressing you transpired in the executive session of the senate but because of the misinformation by people of inundinate ambition out there. It has not only become expedient but it has become very, very paramount that I address you on this subject matter. 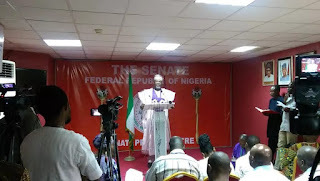 On Tuesday, the 12th of July, we had an executive session to discuss basically on the issue of forgery case in court and when I stood up to address and I want to say that on my honour as a christian on my honour as a father and on the oath of my office as a senator of the federal Republic of Nigeria I am telling you the truth, the whole truth and nothing but the truth. I have never being a coward, I will not start an apprenticeship programme now on how to become a coward. Whatever I say anywhere I can boldly repeat everywhere. When I stood up and I made my submissions that day in the senate, all I did was to pacify my colleagues and asked that the case in court be withdrawn because already there is a resolution of the senate that the rules of the senate were not forged and since there was a resolution of the senate that the rules of the senate were not forged then I said all those who have gone to court should go and withdraw their names from court and that if at the end of the day those who refused to withdraw their names from court we should penalised them by suspending them, I said that. But I did not use any insolent abusive degrading or mannerless language. So there was no reaction from any of our colleagues as regards my presentation. After I spoke so many other senators spoke and I did not mention the name of any senators while I was making my presentation, unfortunately senator Oluremi Tinubu got up and was recognised to speak and immediately she started speaking she specifically mentioned my name even when in my presentation I did not mention anybody names I only appeal to the sensitivity of my colleagues and asked them to withdraw their case from court and reminded them already that there was a resolution of the senate that the rules were not forged. But because of reasons only known to senator Oluremi Tinubu she got up the first thing she said was that she’s being harrassed in this chamber by senator Melaye. I kept quite at that point, she went ahead to say that why will he come here and be threathening senators and there was a large chorus from senators how, when, where, senators reacted. At that point I was still very calm, she got up again and said that this thug must be tamed at that point I got up and I told her that she is very stupid. The next statement from her is that you are a dog. She called me a dog and when she called me a dog I stood up and I reacted and I told her that this is not Bourdillon and that she should look at my face, I am not one of those senators who normally come to prostrate to them in Bourdillon. And I told her I am from Kogi State, I am not from Lagos State and that there would never be a day that I will come to you for political assistance. This were my words and she went on shouting dog, thug. I want to tell you gentlemen of the press for every reaction there must be an action. When I got up to address my colleagues she was not the only senators there. If I had used insolent language or foul languages you will know the type of senators we have they would have reacted and some of them would have even addressed you guys by now to say Dino insulted us. But because she acted in the manner she did not one seantor stood up in her defence when I was tongue lashing her. Even the senators from Lagos was there, Ashafa was there he didn’t stand up fro his seat. It is not true that anybody circled her because there was no need to. I did not leave the spot where I was sitting I didn’t get up from my seat. So there wouldn’t have being anybody to but somehow she got falsehood sold to the saharareporters. Nobody amongst those of us who spoke there actually talked about impeachment. Infact the issue of the presidency or president was not the subject matter we were discussing on how the senate can also come together and solve the forgery case. There wouldn’t have being any need to even discuss about Buhari or the Presidency but because of deliberate wickedness and satanic manifestations they brought in the issue of presidency to garnish their aim and purpose. Today, I read on the pages of newspaper that in Nation to be very precise that senator Borrofice calling me names. Unfortunately, this expatriate senator, absentee senator called senator Borrofice was not even in the Chamber and he has not being in the chamber for the past two months. He was not in the chamber, I was surprised maybe he has celestial powers to understand what happens in his absence. For him to open his gutter and pass insolent languages on me. I have never being a coward and I will never be, I fight my battles alone and I stand by it and there is nothing I say anywhere that I cannot repeat everywhere. If there are instances that I am not a super human being, if there are instances where as a human being I have reacted negatively I am also ready to be apologetic about it. But in this particular instance, I have never mentioned anybody’s name, I never even used insolent languages but because they are here to heal from the wound of defeat of the election of the senate president and because of my key role in this exercise where she and her husband called me severally to appeal to me to backoff Saraki and I say I will not backoff Saraki, I will continue to support Saraki, Saraki is my brother, he is my friend and I will continue to support him and this will not change today, it will not change tomorrow, it will not change in this four years of our stay in the Senate. Every human being can have ambition, it is not a crime to be ambitious. saraki had the ambition of becoming a Senate president and God endorsed it, president Muhammadu Buhari is an ambitious person that is why he contested for the presidency four times before God answered him. I am an ambitious person, I event want to be president of the Federal Republic of Nigeria very soon. So it is not a crime to be ambitious. So if you go through the papers today there has been a lot of misinformation, a lot of lies, a lot of blackmail, planted stories just to discourage the person and personality of Dino Melaye but I want to assure everyone that I remain resolute in my compaternal convictions, I will continue to stand by the truth, I will continue to speak for those who cannot speak for themselves, I will continue to be a voice to the voiceless and in reaction I heard that Senator Bola Ahmed Tinubu said my political career has come to an end. I want to say that Tinubu is no God. I fear only the God almighty, I fear no soul I only respect souls. So far my political journey to the House of Representatives and the Senate have no political, financial or moral contribution of Senator Bola Ahmed Tinubu, the God who has brought me this far is mighty, strong and enough to take me further, what God has given me no man can give and what God has given to me no man can take. I want to assure you that this is the true story of what transpired. It is falacious, malicious and a lie that I said I will impregnate Mrs Tinubu. Biologically it is even impossible to impregnate Mrs Tinubu because she has arrived menopause. If you also look at that statement for those of us who are intellectually mobile, how can you say you want to beat somebody and at the same time you want to impregnate the person if you juxtapose the two is there any correlation, does it make any logical sense. So, when they planted this falsehood they did not think deeply. I want to say that I will continue to uphold the culture the tradition, the values of the Kogi West Senatorial district and I will not abuse it. But it is absurd for a woman to look for her colleague and call him a thug and a dog when he has not personally addressed you. unfortunately I did not have the anointing to be quite when you are being insulted I replied accordingly. I repeat there is no reaction without an action. If she did not call me a dog or a thug there is no way I would have responded. I responded I have no regrets for responding and defending my person and if tomorrow or in the next 1hour, Senator Tinubu again called me any name I shall equally respond accordingly.